Right now, we’re sitting on a beach in Turks & Caicos, but since we’re in the process of compiling information on this fine island gem, we thought we’d inform our readers about another one – especially given the fact that we keep meeting so many lovely Jamaicans here in Turks. 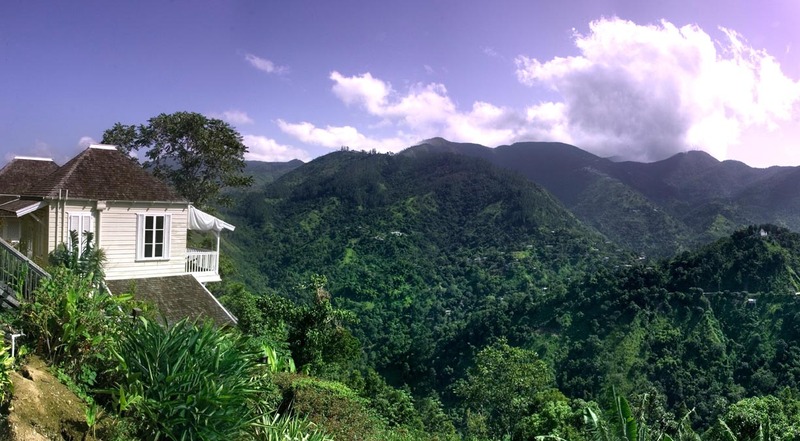 So, when we were just told that, located in the heart of one of the world’s most famous coffee-producing mountain ranges, Jamaica’s Blue Mountains, Strawberry Hill Hotel & Spa has re-opened this month following an extensive refurbishment of the property, we were all over it. Listed in the New York Times #1 bestselling book, 1,000 Places To See Before You Die, Strawberry Hill is 3100 feet above sea level and features one of the most awe-inspiring views of the Blue Mountains in one direction, as well as the city of Kingston in the other. 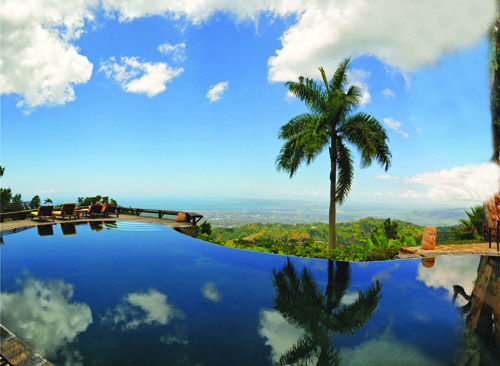 On a clear day, one can see up to 40 miles from the property’s infinity-edge pool, and at night the city far below becomes a twinkling mirror of the night sky. The property features original antique furnishings, fully-restored, including romantic canopied four-poster beds, solid mahogany desks, and ornate hand-carved fretwork. Brand new soft-finishes round out the update with exquisite, hand-dyed linens by Royal Hut. The spa, a focal point of the high-up hideaway, specializes in stress-relief, body and soul rejuvenation, and wellness activities. So, whether it’s a nature-curious guest wishing to explore, or one looking to get the blood pumping with an outdoor workout, Strawberry Hill’s verdant surroundings provide the ideal playground for both. On offer are hiking trails of varying intensity, grounds that are considered the most exotic tropical gardens on the island that include an organic coffee farm, and the opportunity to see most of Jamaica’s 26 beautiful endemic species of birds. The exciting new menu at Strawberry Hill’s restaurant also feature a fresh take on classic Jamaican culinary favorites, highlighting the influence of the island’s multi-ethnic heritage of East Indian, Spanish, British, African, Chinese, and Lebanese settlers who have called Jamaica home since the 15th century. The organic fruits, vegetables, meats, and poultry used in Strawberry Hill’s kitchens are sourced from the property’s own gardens and Chris Blackwell’s personal farm, Pantrepant. Chefs now also serve up delicious local dishes prepared with traditional pimento-infused techniques, using the new stone grill on the property’s main lawn. Channeling the hotel’s rich music history, acclaimed DJ and Quango label founder, Bruno Guez, produced all new musical playlists for the public spaces that perfectly match the vibe of this cool high-altitude escape. iPods with pre-loaded Bruno Guez playlists are available for guests during their stay. We especially like that part. Nightly rates from $235/night. From now until December 15, guests who book three nights will receive a complimentary de-stress spa treatment per person. Valid for travel completed before December 19, 2011. This entry was posted in adventure travel, caribbean travel, couples retreats, exotic travel and tagged jamaica deals, jamaica hotels. Bookmark the permalink. Now, there is an admission fee/access fee of US$15.00 or JD$1,000.00.